Education is the most powerful weapon for fighting against poverty. In a developing country like ours VE is a must for economic upliftment and poverty alleviation. Poverty is probably the worst misfortunate afflicting our countrymen. A very large percentage of our population remains miserably poor even today. It directly results in their being plagued by superstition, poor health and malnutrition and living in sub-human conditions in dark and dingy hovels. Of all the efforts that have been made to eradicate poverty, though total eradication of poverty from Bangladesh is a distant dream, vocational education can play a vital role to improve their standard of life and to help them participate in national development. Vocational education means learning to change one’s behaviour to enhance the quality of life through work and values, without or along with formal schooling. If the learning through the vocational approach enhances self-employment and economic productivity of the people then the war against poverty can be fought and conquered in a constructive way. Many countries like Thailand, Malaysia, Indonesia, Philippiens have got a lot of economic benefits through Vocational Education (VE). So it has been proved that economic implications of VE are many, particularly for a country which has a vast population of adult illiterates. So the time has come for us to find out the role of vocational education in poverty reduction of Bangladesh. We also need to identify measures to make VE more effective in poverty reduction. VE is basically life and need based education which can convert an un- skilled in experienced and illiterate population into human resources Formal education system, because of its rigid chronologically graded structure and inflexible nature excludes the poor from its advantages. In this circumstance as the alternative of formal-education (FE) it is very much necessary to evaluate vocational education so that we can determine the extent of its success and weakness at any stage of poverty reduction as it is considered the best way to bring about longer lasting socio- economic change and self development. ii) To determine the role of vocational education in poverty reduction of Bangladesh. iii) To find out the socio-economic conditions which are strongly influenced by Vocational education. This term paper studies the role of vocational education in poverty reduction. Mainly this study is based on the context of Bangladesh but in a very few cases examples of other countries have been cited. This study includes information about VE Programmes of Bangladesh, nature of poverty in Bangladesh, fighting ignorance through VE, national economy, functional literacy, self-employment etc. This study covers very small sample, which might not represent the over-all situation of vocational education and poverty reduction. However, by this term paper which is specially prepared as a compulsory part of foundation training course, future researchers could be encouraged. Mainly social survey method was used for collecting data. In this regard structured and open ended questionnaire related to respondent’s socio-economic condition, VE and poverty were used. Through informal interview and open group discussion primary data were collected. Besides this some helps were taken from NGOs. To develop a theoretical understanding and to collect secondary data upazila statistical report, relevant research report, other literature, newspaper and inter-net were used. Collected data were analyzed by simple arithmetic mean. 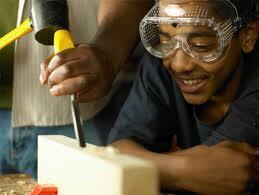 Vocational Education (VE) is an important form of education. without rigid rules and regulations of formal educational institutions. Education which increases the productivity of the learners to improve their living standard is termed as vocational education. In the easiest and most acceptable way vocational education may be defined as learning to change one’s behavior to enhance the quality of life through work and values with or without formal schooling. VE is the active process of over all community development. From the above mentioned definition it can be said that, vocational education is a form of education system which is free from formal schooling and aims at teaching the poor how to improve the quality of their life through work and awareness. Poverty means destitution. It signifies conditions of life, limited by low nutrition. illiteracy, disease, high infant mortality and low life expectancy. The world bank development report 1990 defines poverty as the “inability to sustain a minimum standard of living”. According to Dr. Ali Akbar “poverty is such an oppressive socio-economic condition where people cannot meet the bare subsistence of living”. From the above mentioned definition it can be said that, poverty is a situation of life in which people suffer from malnutrition, illiteracy, disease etc and are unable to sustain a minimum standard of living. Poverty is probably the worst misfortune afflicting our country. In spite of our vast economic potentials, a very large percentage of our population remains miserably poor even today. A direct outcome of poverty is illiteracy. Because of their ignorance, the poor have hardly any access to increased economic opportunities, and have apparently been segregated from technological and scientific advancements of modern times. They are being exploited, a miserable existence and have been compelled to drag a miserable existence. They have even become apathetic to any positive change. Vocational education is not confined to any specific category or group, but due to limitations of expertise and resources the target groups may be determined as follows on the priority basis..
i) Those who never went to a school. ii) Those who dropped out of schools. iii) Unemployed youths in search of jobs. iv) Young men and women in the rural areas. v) Youth in tribal areas . ii) Although place, contents, policy, time of obtaining Education are predetermined, yet these can be changed according to the need of the learners. iii) Life long or no limitation of time for this education system. iv) Education activities are directed in congenial atmosphere. v) Life and need based educational curriculum. vi) No any examination fear. viii) Sometimes a minimum course fees are taken. i) To create opportunities for basic education and development for those who are deprived of proper formal education thus lag behind. ii) To impart vocational and technical knowledge so that they can be skilled and blooming human resources . iii) To ensure participation of the people of the society in development activities. iv) To remove illiteracy and develop total standard of living style . I took help from different books journals newspaper articles, and reports which have been mentioned in the selected Bibliography. UEO’s data show 57% of student were enrolled in GPS, 24% in RNGPS, 9% in madrasa, 2.5% in kindergartens and 1.1% in VE. Thus, non –formal education enrolment appears to have been underestimated. The scopes of VE in the areas of science and technology are numerous and are still increasing. Some of the examples are computer operations courses, servicing of the electronic equipments, repairing of electrical home appliances and the like. Courses in weaving, dairy farming, bee keeping, agriculture farming, fish cultivation, poultry raising, sewing, embroidery work, tailoring, food preparation T.V and radio mechanics/ servicing etc are also noteworthy. Exotic food preparation in the cities is of another increasing demand. This is already being met by vocational training by the urban women wishing to learn fancy cooking, baking, preparing Chinese dishes, party snacks, fast foods etc. Training in preservation of fruits and making syrups Jams and Jellies etc is also provided by VE. The main emphasis on vocational education should be on programmes based on contents which have direct relevance to struggling against poverty and activating the people to solve various problems they face in their day to day life. The contents of Vocational Education are given below. iii) Elementary principles of health, hygiene, child-care and nutrition. iv) Basic, skills in reading writing and arithmetic. vi) Family planning and activities for professional development . Many adults perceive their educational needs to be secondary to their economic needs. Vocational education, therefore, needs to be linked with economic programmes, specially for the weaker sections. Unless the poor perceive the prospects of economic upliftment through literacy, they will not feel motivated towards education. Development of new skills, both in agriculture and industry, and participation in various crafts can help the learners achieve this purpose. In this respect the vocation oriented non formal education can be a tool for both educational improvement and the much desired social change. Most of the participants is this type of education should be women, specially the weaker section of women. Illiteracy, ignorance and superstition are very high among women. Besides removing these obstacles it winders women’s mental horizon and develops their productive skills through better use of their leisure leading to self-employment or to some gainful employment outside the home. In a large country like ours, with its vast number of illiterates, semi-literates, the educated unemployed, the big rural population and the rapidly multiplying urban poor, it is obviously necessary to initiate an overall open educational system with a wide choice for the learners. Much more emphasis will have to be placed on the vocational ways of education, particularly for those who are excluded from the benefits of formal schooling. At present various government and non-government development organizations are trying to upgrade the backward people of the society. In this regard BRAC, Dhaka Ahsania Mission, PROSHICA, Plan-Bangladesh, etc have adopted many community based programmes which have helped them to take part in active national development. On the planet, more than 140 core people, two-thirds of whom live in abject poverty, earning less than one dollar in a day. At the same time our planet’s ability to sustain itself, is eroding. Declining ecosystem and growing social and ecological vulnerability affects everybody but poor people suffer their consequences more than the others. The main challenge that developing countries face isproviding access to food, safe water, sanitation, education and health services to ever increasing population who are mostly poor. So, major challenges for all poor countries is poverty reduction and for a country like Bangladesh this is of outmost priority. But the question arises why they are poor? Is it that they have chosen to remain poor or they are poor because they are poor mentally, physically, economically and environmentally? Nobel Laureate Dr. Amartya Sen concludes, they are poor because they are deprived of their access to resources and so suffer from poverty. Poverty is caused by the lack of exchange entitlement in a market economy. Sample size is very important in ensuring the effectiveness and fruitfulness of the research. However, some aspects like time, fund, desire of accuracy, type of people or situation being studied, resources available and purpose of the study may control sample size. In this study weighing the vocational graduates of different occupations sample is important. The following table shows the sample size. In Bangladesh the number of vocational graduates is a big one. The researcher was not able to have a large sample from all the countries. So the sample was drawn from a specified area and on which the result of the study was generalized. Data have been analyzed mostly manually except in case of finding out the summations and percentages. First data were patterned in tabular form according to the fulfillment of research objectives. During this time the variable underlying the investigation were kept in mind. The tabular form was consolidated into pieces of information regarding the objectives. For analysis of data, help of Computer has been taken. Presentation of tabular data was transformed into different graphs or charts with the help of MS Excel & MS Word. Vocational Graduates were asked in a friendly atmosphere to speak the truth about their social and economical life and from their answers the data were collected. Some data are related to economic condition and some to the employment opportunity. All the respondents’ opinion have been collected in the following tables. ♦ The above table shows that the maximum vocational graduates earns 6000 Taka per month. ♦ Most of the respondents are able to fulfill the basic needs and other facilities of the family. ♦ 60% of the respondents are saving some portion of the income for future development. ♦ Maximum respondents have Black & White Television. ♦ Most of the respondents are getting jobs for vocational education. ♦ 66.67% of respondents have effect of vocational education for self-employment. ♦ Maximum respondent do not get Bank loan for their workshop. ♦ Most of the employers are satisfied with the performance of the vocational graduates. 63.33% respondents do not achieve proper practical knowledge in their respective institutions. Limited scopes of data collection from the real field of the study. Appropriate statistical method is not applied for deciding sample size of the study in relation to population. Own cost involvement of researcher for the study, no support from NAEM. Limitation in degree of accuracy desired from the study. Limited scope to involve various types of population in regard to the key characteristics or situation being studied for the purpose. 1. Most of the VE receivers had admitted that VE had a great contribution in their poverty Reduction. Ø Most of the VE receivers have sufficient calorie, protein and vitamin intake. Ø Most of the VE receivers are able to get necessary heath and hygiene measures, suitable housing facilities and employment. Ø Most of the VE receivers have better access to income generation, education and self- employment. Ø They earn a minimum salary to meet the basic needs. They admitted VE creates opportunities for self employment. In the document analysis it is found that VE has played a significant role in poverty reduction of Bangladesh and other countries. b. To remove political urnest. c. Skilled, competent, and experienced persons should be appointed so that they can conduct effective and efficient need based curriculum for VE. d. Morality should be established from the lower to the higher level of education. g. Educational media for VE such as Radio, TV, Cinema, VCD, newspapers various government and non-government organization should be strengthened . h. Integration should be established among the medias and various organizations. i. Job sectors should be attractive for these who receive VE. j. Teachers will be trained up appropriately for effective and quality non formal education. k. Contact hours a day will be two and half hours and six days a week, Teachers will set class time through discussion with the community in a flexible manner. l. Teachers will be closely supervised and followed up and participatory monitoring technique will be applied as per frequency for knowing the progress based on planned actions. m. School management committees will decide on issues related to vocational education. n. Individual learners’ progress will be shared in the monthly parents meetings where motivational awareness for education will also provided to the parents/guardians. o. Each VE center will ensure that every child has access to the minimum inputs necessary as a foundation for an acceptable quality of primary schooling. p. Above all the Govt. has to take more effective programme for VE to reduce poverty. Children leaving school, particularly if their parents are poor and there is consequent economic pressure to enter employment quickly, often enter jobs unsuited to their abilities, aptitudes, and interests. This leads not only to personal frustration but to lowered efficiency and manpower wastage. One way to avoid this and to place young persons in more suitable employment is by the use of the techniques of vocational guidance. It seems to us that the introduction of such provisions is a, necessary corollary to the full utilization of the program of vocational education that is proposing. A large number of pupils at present stay on through Classes IX and X of the general secondary schools because are to young to enter employment and no suitable alternative education is available. However, as soon as facilities for teaching practical arts are available in the middle schools, an increasing number of boys and girls will complete Class VIII with real aptitude and liking for practical studies. These pupils are likely to be attracted to a suitable alternative course, which would provide them with workshop and increasing the GDP of Bangladesh. 1) Infrastructure planning for Vocational Education Edited -by Dev Raj singh. 3. Vocational Education for Rural Women TA, Koshy. 4. Some perspectives on Vocational education – J.P. Naik. 6. Administering – Non- formal education. for Jhai villagers – warren L. Mellor.